“Oh my goodness! 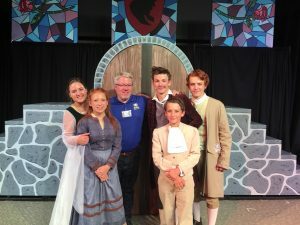 Is that your Dad?” Those were the shocked words of one of my teenage son’s friends as I walked—clad in cool “skinny jeans” and Van shoes—across the boiling hot parking lot into the building where six of my children were preparing for a performance of Beauty and The Beast. It was 1:00 pm on that Saturday but I didn’t need to be there until the show started at 7:00 pm. Now, why would you care about that? Great question that I will answer in a moment. You need to understand something about me. Saturday afternoons are by necessity usually devoted to conquering a huge list of fix-it projects around the house and yard. Although exhausting, I love the challenge of getting as much done as possible. But on this day, the snakes that needed killing (we had seen a copperhead in the yard), and the drainage system that needed repair would have to wait. These productions are an annual event that represent a huge moment for my children, probably not all that different from a Disney vacation. In addition to the sense of accomplishment that comes from producing a truly amazing show, my children relish the relationships that have enriched their lives. It’s a big deal to them. While I have supported their participation in years past, I never fully appreciated just how important this experience has been to them personally. It was a great source of joy that I never fully embraced because I was so busy killing snakes or working overtime. But this year was different. I joyfully went—early—anticipating being part of the hoopla, and soaking it all in with them. Sure enough, they were surprised to see me there so early. They seemed excited that I stepped into their world and was genuinely enjoying the moment with them. I was actually humbled and deeply touched that it mattered to them that I was there. This was a good thing for our relationship. I would like to say that this is the way it always is. But it isn’t. This was the work of the Holy Spirit in my heart. As we all know, it is a struggle to balance the polarities in life. We would do well to try to make more relationally-positive decisions. Let us be encouraged by Jesus’ example. He says in John 14:18, “I will not leave you as orphans. I will come to you.” God values presence with us. Consider: God—comes—to—us. He comes rejoicing over us says the prophet Zephaniah (3:17). How can thatbe? He makes us new creations and gives us His Holy Spirit to take up residence in our hearts. He promises never to leave us. As we discern his work providing assurance, peace, joy, and guidance, we learn what the Psalmist means when he says in 16:11, “In your [God’s] presence is fullness of joy.” God’s holy presence brings us joy even as we blows lines, even entire scenes in the drama of life. God comes to us and rejoices in us. What a challenge—and opportunity—this presents to us as parents. It is easy to get so engrossed in-you name it- that we miss going to our children and delighting in them. But there is a reciprocal joy for us. All of that together mutually strengthens our relationship with them while accomplishing something more important: exemplifying what it means that God comes to them and delights in them, too.